When I was part of the AmazeCats “Next Top Cat” competition, I met many great kitties, but one of my favorites was Smoky, who works very hard to help her fellow black cats, and special needs kitties too. She used the competition as a way to campaign for donations for cat rescue and raised thousands of dollars! Smoky is a very creative and generous cat. Some of you may not know her because she does not blog, but instead uses her Facebook page to campaign for her causes. She also has a secondary Facebook page, and she is on Twitter as @BlackCats_RULE, on Pinterest and has a YouTube account. So even though she does not blog, she is one busy cat! I was lucky to get her to agree to an interview… actually she was more than happy to talk about what she does, and some of the cats she has helped. I think you will like her as much as I do! Smoky, tell me a little bit about yourselfÂ â€” where you came from and how you came to live with your family. I was abandoned in a neighborhood when I was approximately one year old. My parents first spotted me on Thanksgiving, 2007. I was wearing a collar, so they did not know I needed a home right away. Since it was a holiday, they gave me some smoked turkey as a treat. My name is Smoky because I am black like smoke and because of the smoked turkey. I am an advoCAT for black cats. What inspired you to help make a difference for your fellow black kitties? When I learned the statistics, I knew I had to do something to help. In many cases, black cats are the first to be euthanized and the last to be adopted due to superstitions and stereotypes associated with black cats. 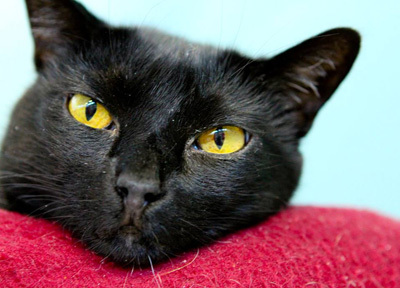 Many consider black cats “unadoptable” because of their fur color. 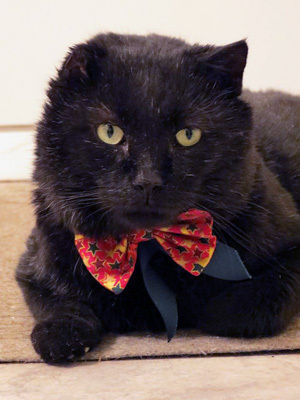 When a cat is black and something elseÂ â€” black and a senior, black and special needs, black, senior and special needs, you can imagine the outcome. It is not good. Black cats can wait up to four times longer to get adopted as their lighter colored fur friends. Meet Cola. Cola is one of my new BFFs (black fur friends). She has been waiting for her furrever home for over 890 days; that is almost two and a half years! Do mew have room in mewr heart and home for a black beauty? If you live in the Sarasota, FL area, stop by the Cat Depot. Love knows no geographical boundaries. Cat Depot will approve an out of state adoption. Transportation can be arranged through Imagine Home and the Underground Railroad Rescued Kitty Network. Black cats have a reputation for being “mean” and “scary.” Just the opposite is true. Black cats tend to be very social and affectionate. Their fur is black, but their heart is pure gold. You are so right, Smoky! My human has found that black cats tend to be friendlier and more fun than many other kitties. What are the dumbest myths you have heard about black cats? There are many, but the dumbest of all is that black cats will steal mewr soul. A black cat will only steal mewr heart. I like to focus on the positive. Black cats are thought to bring good luck in many cultures. Tell me about a couple of your most gratifying moments as a kitty who works to help black cats. I recently competed in the AmazeCats Next Top Cat Competition. I used this opportunity to help educate the public about black cats. 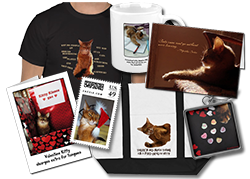 In addition to black cat advocacy, my campaign raised money for three different charities. This was a “bracket style” tournament competition and went on for weeks. The longer I was in the contest, the more people would learn the truth about black cats. Despite the fact, I was the “undercat,” competing against cats that have very large followings in social media, I made it all the way to the “Feline Four” round of the competition. 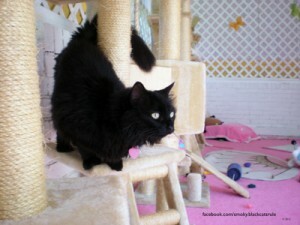 Thousands of people learned about black cats and over $3,600 was raised for charity. Black Cat Rescue is dedicated to saving the lives of homeless black cats and kittens by providing quality foster care while actively seeking loving, permanent adoptive homes. Tenth Life Cat Rescue saves stray cats and kittens in the St. Louis area, prioritizing those with special needs. Spay the Strays works to reduce the feral cat population in Osceola County, FL through TNR (Trap-Neuter-Return) and to place the many wonderful cats and kittens left behind into loving homes. Another gratifying moment is when I learned my BFF (black fur friend) Gentle Ben was adopted because his meowmy learned how difficult it is for black cats through my advocacy work. Gentle Ben is missing an ear in addition to being black. In addition to the groups above, what are some of your favorite causes/ charities? Advocating on behalf of senior pets and helping senior pets find their furrever homes. Do you have any special black cat heroes? Oh yes, Lincoln. I call him Linky. He is one of my BFFs. Linky was born a quadriplegic. Through a lot of physical therapy and love, he now has use of all four of his limbs and paws. Mew can watch his physical therapy and his first steps on his YouTube channel. Linky was rescued by Tenth Life and is one of their spokescats. Here is his Facebook page. Thanks so much, Smoky! You are living proof that Black Cats Rule! just passed away recently in April; this year. And now have Sassy and she’s a marvelous cat! And Bella was our neighbor’s black cat! Love the black cats. Get one ALWAYS over any cat. and a tabby named Byron. and a Pekinese dog named Gidget; was my 1st pet. And a bunny named Blackie. well loved by others around me and beautiful! Wow! That is absolutely amazing! I am a black kitty myself and was so lucky to have been adopted after being found as a stray when I was only a few months old. My mommy considers me to be her lucky charm and all of those superstitions and stereotypes are ridiculous! Us black cats need help and we are so glad that you are there to do it!! 😀 Pawsum interview wif Smokey n he iz bery handsum..in fact ALL da blackiez are beeuteefull!! Dat gentle Ben iz strikin n so guud lookin. We iz so glad Linky can use hiz 4 leggz…me Mum waz married to a Hu’man Quadriplegic so she waz leaky eyed readin ’bout Linky n happy he iz doin so well. Phankz fer a grrreat interview. Pawsome interview , Sparkle ! Congratulations on getting adopted Smokey!! Woot!! My dad had 3 all black cats and each had their own distinct personality–I loved each one of them and so did my dad. I am in awe of Smokey. She makes me proud to be a house panther! SMOKY IS MY KIT! I have had the pleasure and honor of knowing Smoky a long time now, she is a wonderful soul. I met her when she first appeared on Facebook and have watched her grow up to be a committed and thoughtful advoCAT for Black Cats everywhere. Before my own black panther sister ÄŒerny went to the Bridge a year ago, she was a huge admirer of Smoky and her message. I fully support my fellow black cats and urge people to help stop the myths and superstitions that plague these loving, kind, good kitties. My sister adopted our family at our local shelter where she had been abandoned by her former physically abusive ‘guardian’. The first 6 of the 9 years we had with her were not easy, for she had a hard time trusting and suffered from PTSD. Through patience, love, medicine, acupressure, and calming essences ÄŒerny eventually found some peace, trust, and confidence. The abuse she suffered the first year of life was because she was a black cat- HOW can anyone hurt a baby kit just because of the color of her fur?! I am appalled and offended by this and will fight alongside my friend Smoky to help educate the public about the plight of these amazing cats. I’m with mew Smoky: BLACK CATS RULE!!! Black cats rule and I bet your human will adopt one down the road. Pop loves black cats but when they were looking for a cat to adopt with me, there were no black cats. They adopted a black & white tuxie with me but she didn’t work out. Great interview, Sparkle! We think Smoky is amazing, and we enjoyed learning more about her. Happy Black Cat Appreciation Day! Great interview! 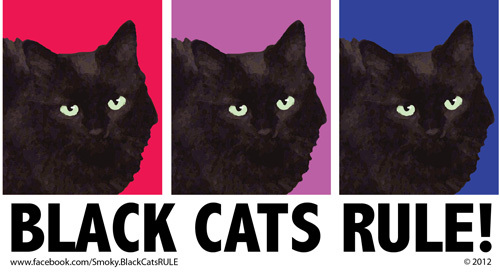 Black cats do indeed RULE! This makes mom smile and have the feel of leaky eyes. She wishes she could wave a magic wand and make every kitty adopted, healthy and loved forever more. Black cats also have such beautiful fur! You know, Mom’s chief complaint about having cats is how the fur shows on all her dark pants and skirts. Now BLACK fur must be invisible!! That’s a way to help promote black kitties! Awesome and shared with <3 Black cats rock! 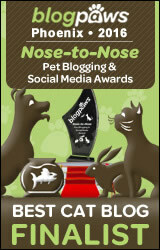 Pawsome interview .Black cats rule and Smoky is the most famous black cat on facebook. 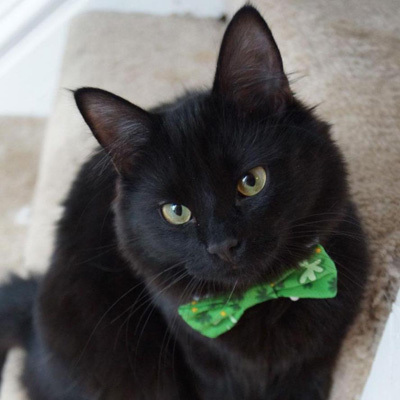 We loved this interview and sure do hope more and more people realize just how silly the myth is that black cats bring bad luck. A cat, regardless of the color, only brings love, companionship, and spirit to a household. My husband says that he has always wanted a black cat – when we have been out adopting there never was one at the shelters….Wonder why? Maybe because they are often the first euthanized? A very nice interview. I’ve know Smoky a long time & she does so much to help black cats. We have a black cat named Sharpie. I fed his feral/stray mom & she brought him here to eat & he stayed. He is now a cherished member of our household. We always wanted a black cat, but we adopt the ones who adopt us it seems. The ones who show up here in the dead of winter, or pregnant, or…you get the idea. So glad a black one finally needed us. Sharpie is the sweetest cat we have ever had. Sparkle–glad to meet you. Just found you through this article actually. So I liked you Facebook page & signed up for your newsletter. We had a kitten named Sparkles once. Great interview Sparkle. Black cats are so beautiful. Such a terrific interview and such wonderful black beauties! We love and appreciate black cats every single day! What a great interview! We couldn’t agree with Smoky more! Black cats rule!! Smokey is so very handsome and Mum would have loved to give him a cuddle – she had a black cat before she had us and he (Max) used to chase off any other cats who came up to her to say hello. Sadly he died of cancer when he was about 15. We are glad there is a black cat day and so is Mum. We will have to be extra special nice to Carl today! We just don’t understand how people can believe those stupid superstitions in the 21st century. You are one of our winners, Sparkle, so you can wrap Binga in collars! Please contact our mom at edensp1 at hotmail.com Purrs! That was such a wonderful interview and we would like to get to know Smoky better too. I didn’t know that it was Black cat day and since we have three black cats that we love, we are so sorry. Glad to have met Smokey. Take care. Smoky is amazing! Our mom’s first cat was solid black. She has always said she was one of the smartest animals she’s met! Happy Caturday! What an amazing interview and an amazing kitty. Thank you so much, we really enjoyed reading it. My very first cat was completely black, she shared my life for a little more then 20 years. She was the most intelligent cat I ever had. She was a simple black cat, but very special. She loved to ride in my car, went with me shopping (sitting on my shoulder) when I was invited Piccola was invited too. I went with her on a tour through Italy and I smuggled her in the hotels. She helped me to choose my future husband, watched over me when I became mother and shared all important steps in my life. That is the best example for a black cat ! !